Greyhounds in the Mist: Hello hello hello, welcome to the blog with a side order of disclaimer. Hello hello hello, welcome to the blog with a side order of disclaimer. You won't find much here other than dog stuff, so if you think it's boring or silly, too bad. It's my blog so I get to post what I want to, read it or don't. That's what blogs are all about! Because I'm moderately lazy (actually not so much lazy, just an extreme multitasker with underlying Attention Deficit and a nasty little procrastination habit) this blog has been a long time coming, and will be a constant work in progress. I will be posting things about the dogs that I have posted elsewhere in years past in an effort to play catch-up to the present, mostly just things that were funny or that explain a series of photos, etc. My greyhounds are our kids. Art and I don't have children, we have the dogs. 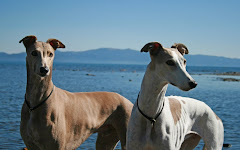 My greyhounds are all AKC registered hounds, they are not retired racers (although they have close friends who are!). 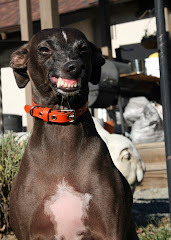 The Italian Greyhound, Q, is a rescue from a puppy mill in Missouri; he's not trailer trash, but he isn't registered with the anyone, even though he's probably the sturdiest and most even-tempered 100% all Italian Greyhound I've ever seen. 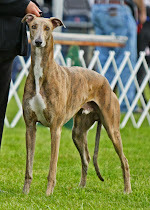 Andretti, Dee and Darby are currently AKC show dogs who participate in conformation, lure coursing, obedience, and rally. I do not represent any breeder; I have greyhounds from two completely separate and polar opposite kennel names. 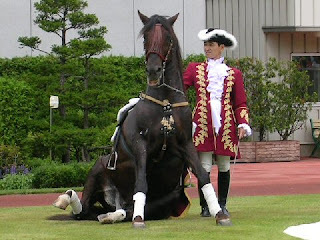 Two of my dogs are Windrock dogs and one of them is an Aragon Aroi dog. I DON'T CARE. A beautiful functional dog is a beautiful functional dog, and through the generosity of both Aragon Greyhounds and Windrock Sighthounds, I have 3 really wonderful dogs. I know it's silly, but the reason I mention this is that sometimes people (greyhound fanciers in particular) will look at the registered name of your dogs and automatically assume that you are 'tight' with the people you got the dogs from. This is not necessarily true. My relationship with the breeders of my dogs is very different for each of them, as you will see in future posts. But beyond their genetics, my dogs are the product of the time and effort I put into them. Some may run better than others, some may show better than others. I may sing praise for one dog's qualities and not another's, I will compare them to each other, and needless to say, their personalities are COMPLETELY different regardless of what kennel they come from. The bottom line is that I have my own mind and my own opinions. I represent me and my dogs, always have, always will. Okay, all disclaimers have been claimed. This is the best introduction I could come up with, stuff from here on out should be pretty fun to read. I hope. I like to write, and as one of my friends has said "Geesh, Lis, that's a flippin' novel" and she's right. But hopefully my novel like posts will be entertaining, and keep you coming back for more. Now, on with the show!